With every passing year, new Linux distributions enter the market with the hope of making it big in the league of the best of best Linux distros. The Linux open source operating system, or Linux OS, is a freely distributable, cross-platform operating system based on Unix that can be installed on PCs, laptops, netbooks, mobile and tablet devices, video game consoles, servers, supercomputers and more. Linux is used for networking, software development and web hosting. A distro, or distribution, is technical lingo abbreviation for a Linux operating system (OS). Each Distro is differentiated by its default interface, i.e. the way it looks, the library of apps officially supported by the specific “brand” of Linux, catalog of stock applications and even repositories. In this article, we bring to you the best 10 Linux distros for desktop that are readily available for installation. Linux Mint is a community-driven Linux distribution based on Debian and Ubuntu that strives to be a modern, elegant and comfortable operating system which is both powerful and easy to use. Linux Mint takes a more standard approach to the desktop, but layers just enough eye candy and variation to make it stand out from the long-in-the-tooth desktop metaphor. Both its Cinnamon and MATE desktops are more traditional interfaces that will probably be a bit more familiar to users leaving Windows than Ubuntu would. Linux Mint is also relentlessly dedicated on improving the desktop of today, while the Ubuntu project is working on a smartphone operating system, creating new software package formats, and entirely rewriting the Unity desktop for phone-PC convergence. Linux Mint is install and go. It means that the pre-installed applications make Linux Mint usable instantly after the installation. The best part is the default desktop environment, Cinnamon, even though it also comes in two other flavours, XFCE and MATE. For those newer to Linux, these desktop environment change the look and layout of the basic Linux interface and its Start menu. You can get started with Mint here. elementary OS is one of the simplest Ubuntu-based distros available, and as such is a good starting point for beginners. It is the vehicle to introduce the Pantheon desktop environment, similar to how Linux Mint introduced the Cinnamon desktop environment before Cinnamon was available in other Linux distributions. Elementary OS is quite strict about the holistic look and feel. The developers have created their own components, including the desktop environment. It provides excellent uniformity between all the stock application and an overall extremely clean design with simple animations. Additionally, they choose only those applications that fit into the design paradigm. The menu is on the top left corner where you can search all the installed applications. One can find heavy influence of Mac OS X on elementary OS. You can get started with elementary OS here. Ubuntu Linux has long reigned the king of user-friendly Linux. Out of the box, it’s a challenge to find a desktop (Unity) that is more engaging and easy to use even for those unfamiliar to the platform. The desktop layout, although different, is logical and intuitive. With the addition of one of the single most powerful search tools of any desktop environment, Ubuntu Unity should be considered a crowning achievement among the Linux faithful. With installing Ubuntu, you also get a wide range of software that includes LibreOffice, Firefox, Thunderbird, Transmission, and several lightweight games such as Sudoku and chess. It also installs Flash plug-in and various codecs. Also, there are loads of easy-to-understand alternative packages available right from the Ubuntu website. These include versions with the LXDE, MATE, XFCE and GNOME desktop environment skins as well as Ubuntu Studio for creative types. You can get started with Ubuntu here. CentOS is the free version of Linux distro for beginners derived from non-free Enterprise version Red Hat Enterprise Linux [RHEL]. CentOS created in the idea to provide a free option for enterprises and other organizations seeking an operating system. This distribution is the gold standard when it comes to community-based servers. Its focus is on stability rather than constant updates, which in turn greatly reduces the risk of crashes and errors. The support of releases is massive too, spanning 10 years from initial release, so you won’t have to worry about upgrading your system so often. CentOS is equipped with a wide array of impressive security features, including an incredibly powerful firewall and the SELinux policy mechanism. You can get started with CentOS here. Privacy has become a major issue in this age of mass surveillance and tracking by marketers (anonymous tracking for targeted content is acceptable). If you are someone who needs to keep the government and marketing agencies out of your business, you need an operating system that’s created — from the ground up — with privacy in mind. And, nothing beats Tails for this purpose. It’s a Debian-based Linux distribution that offers privacy and anonymity by design. It’s a distro whose aim is solely to keep the identity of the user completely opaque. It routes its traffic through Tor, designed to avoid your outward-bound data from being intercepted and analysed. According to reports, Tails is so good that the NSA considers it a major threat to their hacking activities. You can get started with Tails here. Ubuntu Studio is probably the one-stop Linux OS shop for users with creative talents. It is the officially recognized flavor of Ubuntu Linux and has almost full range of multimedia content-creation applications for workflows involving audio, graphics, video, photography and publishing. Support for audio plug-ins and MIDI input is built in and a virtual patch bay comes preinstalled. With the Xfce desktop environment and low kernel latency, everything is geared towards multimedia production. You can get started with Ubuntu Studio here. Debian is one of the most widely used and popular Linux distributions that gives you easy access to application software without pre-installing them. It is a Unix-like computer operating system that is composed entirely of free software. It comes with over 30,000 free packages (pre-compiled software that is bundled up in a nice format for easy installation on your machine). You can get started with Debian here. Previously known as SUSE Linux and later SuSE Linux Professional, openSUSE’s focus is to develop usable open-source tools for software developers and system administrators, while providing a user-friendly desktop and feature-rich server environment. The operating system is divided into two main distributions: openSUSE Leap and openSUSE Tumbleweed. Leap uses the source code from SUSE Linux Enterprise, which makes it much more stable and is perfect for business applications. Tumbleweed is based on Factory, which is openSUSE’s main development codebase. Tumbleweed contains the latest stable applications and is good for day-to-day use. openSUSE also now offers Tumbleweed rolling release distro. You can get started with openSUSE here. Deepin (formerly known as Linux Deepin and Hiweed Linux) is Linux Distro based on Debian whose focus is on being a user-friendly desktop Linux distribution. It is fast, easy to use, secure and reliable operating system for laptops as well as desktops. It is designed to attract new Linux users with the stylish Deepin Desktop Environment (DDE). It’s simple and intuitive with one of the best system setup panels. DMusic, DPlayer and DTalk are among the dedicated applications. Deepin also has an easy-to-use software center, superior to similar tools in other distributions. You can get started with Deepin here. Arch Linux is an independently developed, x86-64 general-purpose GNU/Linux distribution that strives to provide the latest stable versions of most software by following a rolling-release model. Arch Linux is the perfect Linux Distro for those who appreciate simple, intuitive and well-documented software. It allows you to customize your build using the terminal to download and install packages. It also has a tailor-made package manager called “Pacman”, which makes it easy to build. You can get started with Arch Linux here. 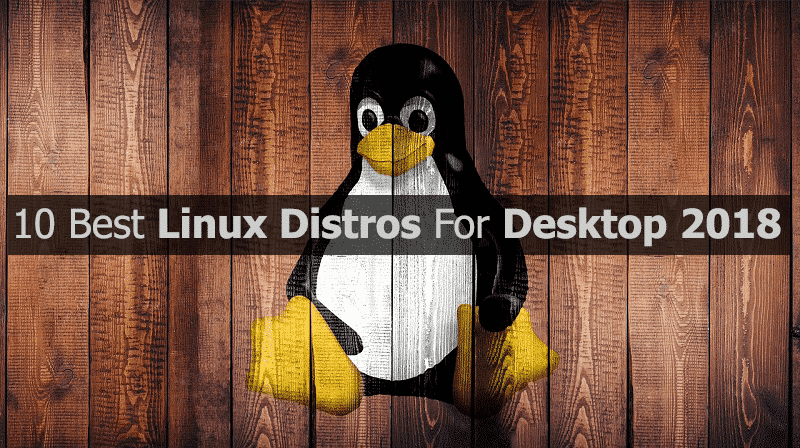 This was our compilation of the best Linux Distros of 2018 for Desktops. Which one did you like? or you find a better Linux Distro. Let us know via the comment box.